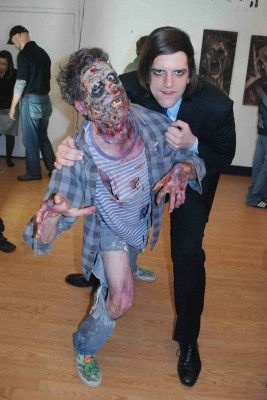 Zombie Bohemia is the story of Michael, a struggling New York City artist, who just happens to be a zombie. Michael (Shawn James) is trying to find balance between his drive to produce memorable, inspired art while also being plagued by the underlying needs and urges of a zombie. In short, he is trying to gain approval and respect from the very people he is biologically wired to consume. Vincent Brando started his film and video career at a young age at his local PBS station. He quickly progressed until he left to attend Brooks Institute of Photography in Ventura CA. While in school, Vincent worked for multiple major production companies and studied how the business worked from the inside. After school, Vincent moved to the Washington DC area to freelance as a video producer/director/editor and to create films with his long time friends Mark Bell, Chris Magdalenski and Brian Chickerino. Brando and Bell established Two Man Island Productions in 2007, making a home for a crew that has expanded into a large group of like-minded individuals who work closely together and support the dream of bringing quality independent entertainment to their viewers.